Homemade flour tortillas are easy to make. They are not easy to get perfectly round, mind you, but they are easy to make. And, once you have made your imperfectly shaped flour tortilla you will be such a tortilla snob that you will never, ever, ever buy them again. I have been making tortillas since the 80s… way before it was the cool thing to do. Before we get started pull up a chair, grab yourself a big glass of sweet tea, and let’s talk lard. You see, most recipes for tortillas call for lard. It is the traditional fat in these things and it gives them lots of flavor. Rather, it used to give them lots of flavor. Like nearly everything else in our modern pantries lard is not what it used to be. Here’s the deal. The lard that your great grandmother used in her pie crusts, biscuits, and flour tortillas was leaf lard. Leaf lard is a soft fat that is found around the kidneys and loin of the pig. It has little to no flavor and a really high smoking point but best of all it makes pastries light and flaky. Sounds great?Here’s the catch. You can’t get it at your local grocery store. Oh, you can get lard all right – and we’ll chat about that in a second. You may be able to find it if you have a small farmer in your area that raises heirloom pigs, you might be able to find it in some specialty shops. Either way you are going to pay out the nose for this stuff. It’s gold. Everyone should try it just once but be ready to pay for it for sure. Leaf lard is a natural product and I don’t care what the margarine companies say, it’s not unhealthy. Now, the block of stuff you are going to find in your grocery store is also called lard. Keep in mind that it is put on the shelves by the same people who call highly processed soy products “bacon bits”. Grocery store lard is processed, hydrogenated, transfatted, and a plethora of other humiliations until it has completely lost any resemblance to what had once cushioned the organs of a pig. Not only will it not give you the same result, it won’t even give you an edible result. Do not fall prey to those who call that stuff lard. Just don’t. If you see it in a recipe steer clear. I promise I am telling the truth. Well, unless you know somewhere that you can get real leaf lard. Then I’d use it over butter. Fine. Now that we have that settled we can chat about these tortillas. Homemade tortillas are delicate with just the right amount of chewy goodness. I personally prefer whole wheat ones because they have more flavor. No matter which kind you make you are going to be so surprised at how much better they are than the ones you have been buying. Well, unless of course you have been buying them from a plump abuela’s kitchen. Then maybe you all ready know. Sometimes I do better than others in getting the homemade flour tortillas round but usually they are oddly shaped and I don’t even care. They still make great enchiladas, burritos, and whatever else I might want to make with them – usually a warm whole wheat tortilla with peanut butter, banana, and a drizzle of honey. It’s my kryptonite. I can’t resist. You’ll cut the butter into the dry ingredients. This is easiest if you have a food processor but you can cut it in like you do for pie crust or biscuits. It’s the same principle. You want the globules of butter to be coated in the flour so that when they melt away in the heat it leaves small air pockets. That keeps the tortillas light. You’ll add warm water and mix until you get a ball that feels like play dough. Just be careful to add the water a little at a time. If you add too much you’ve ruined it. You’ll need to knead the dough until it is really smooth and pliable. Cut it into 12 equal pieces and cover with a towel s that the dough can rest and the gluten can relax. This is very important. Don’t skip this part. Give it ten minutes. While the dough is kicking back you need to get out the heaviest pan you have. Cast iron is best for this – I have done it in other pans but it doesn’t work as well. I strongly suggest cast iron. Heat the pan on the stove until it is very hot. Don’t spray it or grease it. Now roll your balls of dough out to 8 inch rounds. Lay them on the hot pan and cook them until they bubble up. You can even press down on the top with a fork as they cook and they’ll bubble up even more. Flip them and cook the other side. We’re talking 10 to 20 seconds per side – max. Slather them with butter and eat them right as they come off the pan. You can also make more later, now that you know how. Here’s a cool trick. Once you have them rolled out you can stack them with squares of waxed paper between them and store the uncooked tortillas in an air tight package. You’ll be able to just cook them as you need them and they will always be fresh. The uncooked flour tortillas will last at least four days. 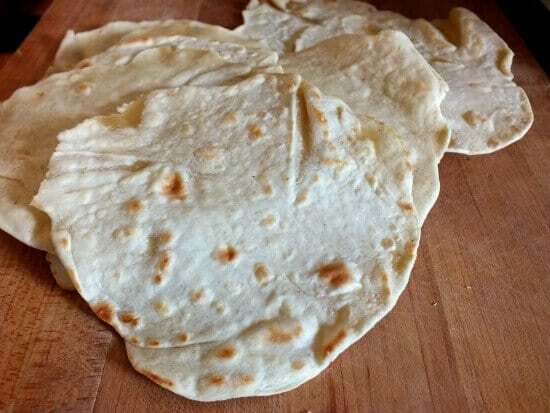 Soft and chewy, homemade flour tortillas are easy to make and they are delicous. You can make them with whole wheat or white flour. You can even make a bunch ahead of time and freeze the leftovers. Mix the dry ingredients together in a food processor or bowl. Cut in the butter until it looks like coarse crumbs. Slowly add the water until the dough just holds together. Knead until it feels flexible and smooth like play dough. This could take 8 minutes or so. Cut the dough into 12 equal parts and cover with a tea towel. Meanwhile heat a cast iron griddle or frying pan until very hot. Lay the tortilla on the pan and cook until it bubbles and gets golden brown spots. Total cooking time will be about 10 seconds on each side or 20 - 30 seconds total. You can mix flour for an interesting flavor. For example you can substitute 1/3 cup oat flour, rye flour, or amaranth flour for 1/3 cup of the regular flour. Don't use much more than that or there won't be enough gluten to make this work. « Quick and Healthy with Minute® Ready to Serve Rice! I made delicious tortillas when I was a young teenager using Crisco as the shortening and they tasted great. I have become a huge fan of coconut oil in the last few years and was wondering if you had ever tried it in your tortillas. I’ve been able to substitute coconut oil for butter, in chocolate chip cookies, cobblers and muffins, to name a few. I’ve not tried your recipe yet but I believe I will give the coconut oil a try when I do. Happy cooking! I bet it would work great! 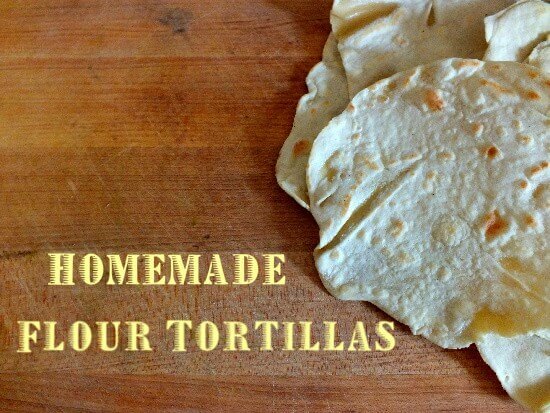 Homemade Tortillas…I made them one time and it has been FOREVER! I need to try your recipe! Homemade tortillas are MY weakness. Mine too. I have to be VERY careful! Marye, I’ve never made my own homemade tortillas, but I’m slapping my head with this post wondering why not? Both flour and corn tortillas are a staple in our house – we absolutely love them in place of bread. I have to try this, because I’ll bet we’d save a lot of money making our own, and they probably taste a million times better too!